Metal objects from the Queen Anne’s Revenge shipwreck site vary greatly in their make-up, condition and functional use. The pewter plates sometimes look like they were just thrown overboard and recovered by a friendly diver, other times they are covered in concretion and/or physically attached to other objects. Pewter is an alloy, mostly made of tin and can be mixed with copper, antimony, bismuth or lead. 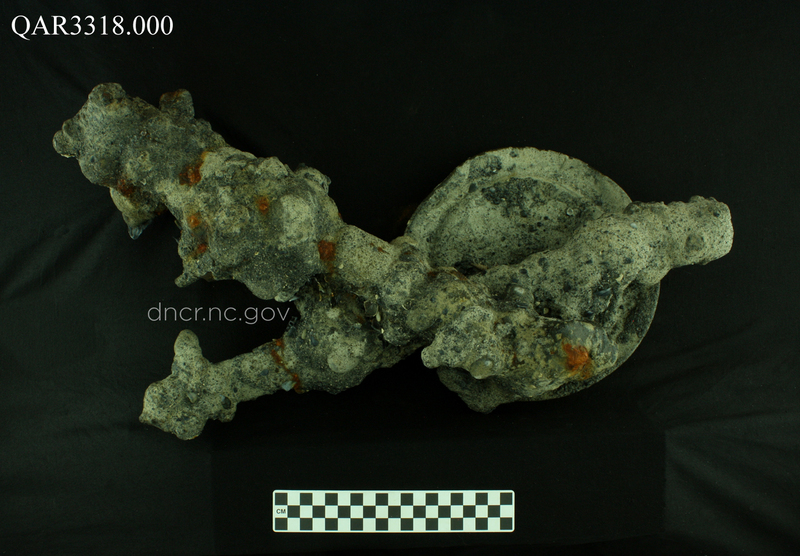 While pewter corrodes, laying a foundation for concretion, it usually does not corrode at the level iron does. If the pewter is near an iron object, the corrosion from the object can lead to a concretion that encapsulates the pewter (and anything else nearby – over 300 years, that can be quite the collection). The most prevalent problem we have with pewter is removing the concreted material. Further, because maker’s marks on pewter plates have been instrumental in the dating of the wreck, the conservator must clean the pewter while taking particular care not to damage these or any use markings. There are a variety of methods used to clean pewter. What technique to use varies with the thickness of the concretion, any staining that might be present, and the integrity of the plate. In a typical case, the initial layers of concretion are removed with an air scribe. As one gets closer to the surface the size of the stylus may change to allow for finer work. If an air scribe is ineffective, a conservator will use a scalpel under microscope to do the extra fine work. As referenced above, this level of cleaning is particularly important around the maker’s marks. Finally, a sodium bicarbonate slurry is applied with a soft bristle brush to fine tune the results. Alternative cleaning methods used for concretion removal, but less often, include electrolytic reduction or glass bristle brushes. Because the pewter objects are often next to an iron object, iron staining is an issue. Sometimes this can be mechanically removed with a scalpel or stiff bristle brush; or chemically removed by using mild acids. Additionally, some improvement in iron staining has been achieved using localized electrolytic reduction. Unfortunately, iron is pretty stubborn and often some portion of the stain remains, as further treatment of the stain may cause damage to the pewter. Pewter is a remarkable metal and its survival has been key in our understanding the ship. And who knows, maybe – just maybe, someday particles from its surface will tell us what was on the menu for the last meal on the ship. 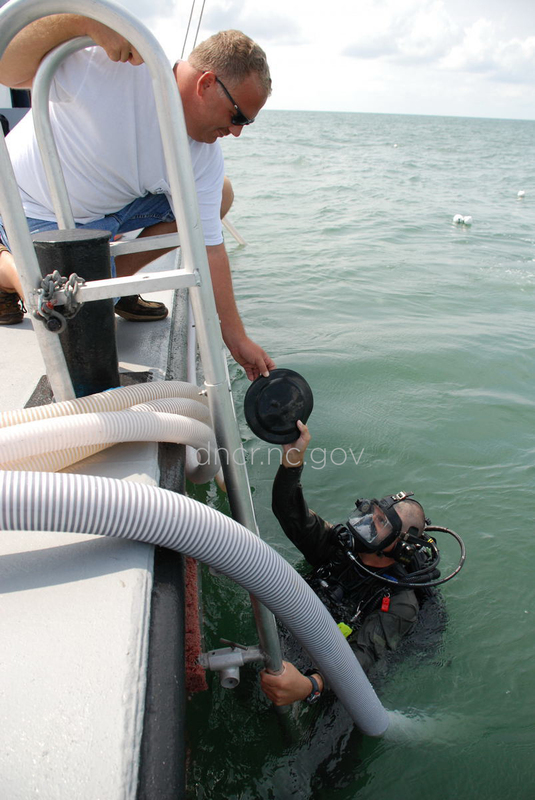 -Diver recovering a pewter plate from the QAR site. Image by NC Department of Natural and Cultural Resources. -Pewter plate in an iron concretion from the QAR site. Image by NC Department of Natural and Cultural Resources. 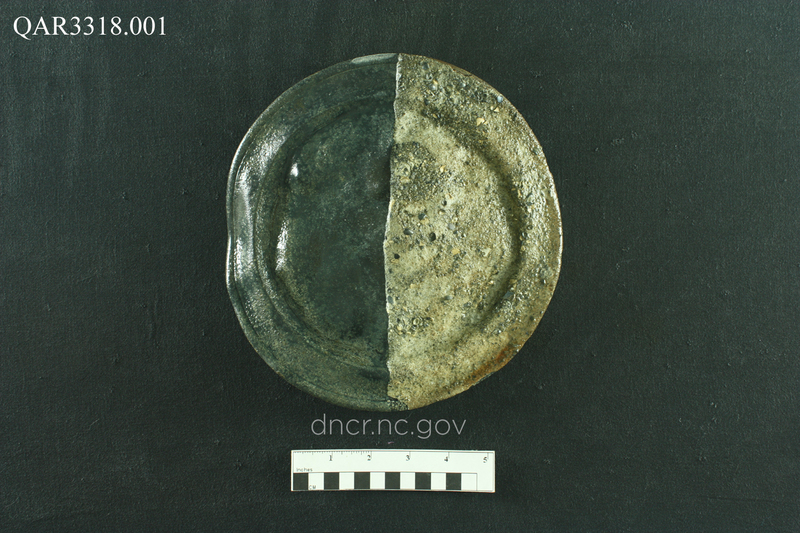 -A partially cleaned pewter plate from the QAR site. Image by NC Department of Natural and Cultural Resources. 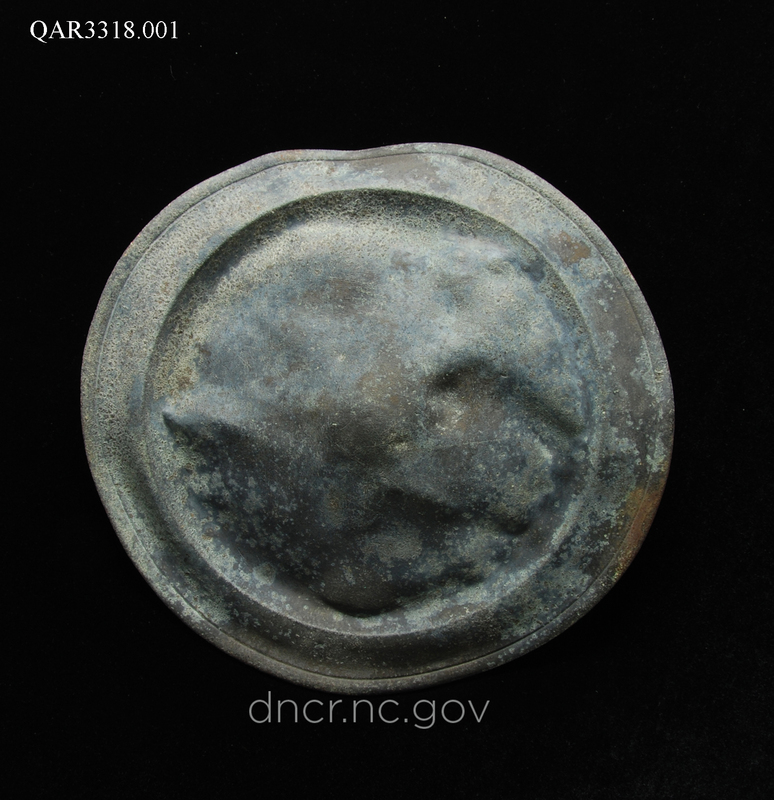 -A fully cleaned pewter plate from the QAR site. Image by NC Department of Natural and Cultural Resources.